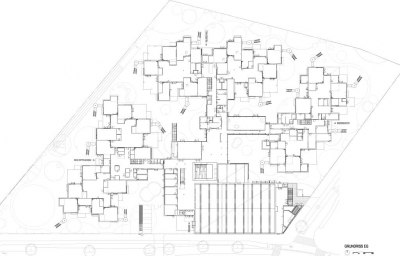 The Sonnwendviertel Education Campus on the site of the main railway station is the first educational building in Vienna to be put out to tender on a target-oriented as opposed to a solution-oriented basis. 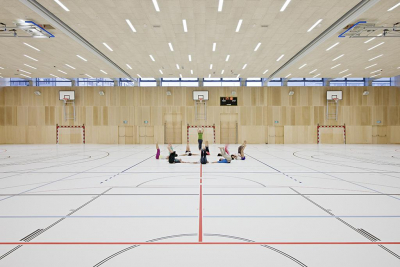 The aim was to find an educational building which corresponds most closely to the demands of modern education. Current education is geared to individual attention for each child. Not instructional teaching is to the fore, but free learning and project-based lessons (assisted by undirected square shape of classrooms). Changing groups of children, in some cases of different ages, tackle tasks, work on projects or receive special support and encouragement. The Education Campus is an all-day, all-year facility with combined classes in the schools. For the first time, the leisure areas were therefore not built separate, instead a living school concept was developed. 1100 children aged 014 will attend the Education Campus at capacity. Roughly one third each a nursery, primary, and secondary school. Each educational facility consists of four clusters. 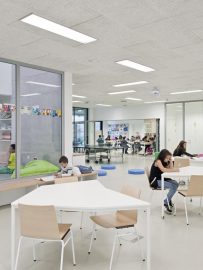 In each cluster four classrooms, one project room, and a team room for teachers are arranged around a market-place (fully furnishable common area that can be used for teaching). The market-place is formed by simply converting the usual circulation areas found in schools. Generally, these areas cannot be furnished or used as they are emergency exits. 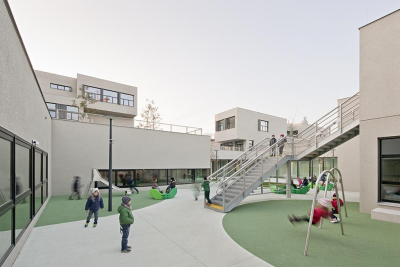 An innovative emergency exit concept enables people to exit all classrooms to the outside via terraces so that there are no limitations on use of the market-place. If you look at two clusters on two levels (GF, 1st floor), there are never two education rooms one above the other. Above each lower room is a first-floor terrace, below each upper room is a covered garden area. 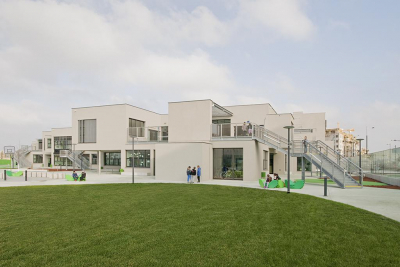 As a result, each classroom immediately adjoins an equally large open-air class area with sunshading, outdoor tables, benches and blackboard. 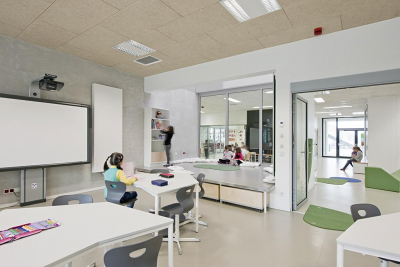 Inside, each education room has a nest, an 8m² bay window with elevated floor and low room height. Project and team rooms in contrast are always on top of each other. In addition to the three two-storey sections of the educational facilities with the various clusters, the common areas are situated in between: multipurpose hall, cinema and theatre staircase, recessed triple gym, exercise/gymnastics hall, library. A number of administrative rooms are situated by the main entrance in Gudrunstraße, with the special education rooms of the secondary school above (IT, handicraft, music, physics, etc.). 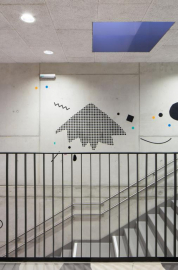 A Combination of a three-colour identification pattern and a multivalent library of forms (designed by Bleed office) are intended to encourage discussion; the colours are also used as a kind of graffiti on the walls throughout the Education Campus, serving once again as a tangible wayfinding system (its getting yellower, I am approaching the nursery, etc.). 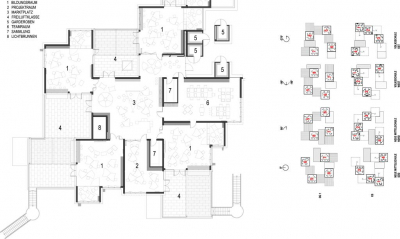 Underfloor heating combined with separate, fast-reacting radiators and decentralised controlled air-conditioning with heat recovery, help to realise the low tech strategy of the building. The campus model is physically articulated on all scales. The overarching educational urgency of the campus model for the town as a whole is implemented in the configuration of the specially developed 3-child-school-tables, in the physical and scale-based division of the various education rooms into reading and craft areas, in the specific orientation of individual education rooms towards the outdoor area and the inner market-place, in the room conditioning of the market-places at the centre of each facility, in the composition of the various education clusters relative to the outdoor area, and in the organisation of the Education Campus as an innovative urban system within the urban development area of the main railway station.